White lines on the road cachunk, cachunk, cachunk, as they slide under the car, producing an acute and swift sense of numbing boredom. Thoughts drift to world conditions. Politicians who talk out of both sides of their mouth. A sense of helplessness, despairing and irritating, pound upon the shoulders like jackhammers, straining the neck. The car glided down a hill into a small hamlet along the Mississippi. 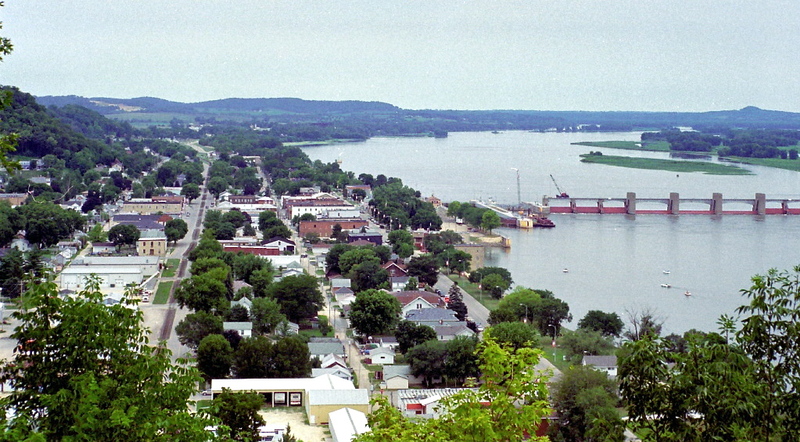 The town’s Main Street runs parallel to the river. Trees line the riverbank, peppered among the iron benches and brick sidewalks. The varying shades of green give a respite to the eyes and other things start coming into view: white gulls; red geraniums; purple and pink hyacinth bushes. A small diner on the right boasts a large, affordable breakfast. There is a parking spot in front, a couple of cars down and nearer the corner. There are no parking meters. The building is a freestanding, two-story structure with narrow posts in front supporting a short balcony on the second floor. The structure gives the impression that it may have been a home once, built for possible flooding. That must have been before the lock and dam was erected, which surely controls the water level now. The first floor is light stone. The front posts, balcony and entire second story are a dark wood. The narrow building has an extended, closed-in entryway framed by triple windows on both sides. Two small wrought iron tables and several chairs sit outside, to the right of the entryway. To the left is a fenced-in yard. An older couple walking in ahead held onto the door, making sure the door didn’t slam into anyone behind them. The smell of strong coffee, bacon and toast zapped the nostrils and lingered in the air, casting a spell of thirst and hunger. There was also something doughy and cooked on the edges…like waffles nearly done. To the right, almost the entire length of the diner, was an eating counter with ten metal, padded stools, snuggled up against it. All but one was empty. Condiments were grouped on the counter in strategic places, an arm’s length apart. Straight ahead and in the center of the diner were six large metal tables. Dark, wooden beams the length of the diner separated the tables from the vinyl booths that sat against the wall, under curtained windows. Handmade crafts decorated the booth wall: a golden-rule message needle pointed, a patriotic olive branch wreath with a flag, and red, white and blue ribbons tied in bows. The linoleum floor was cracked and had seen better days, but it was all aglow and shining from a recent scrubbing. Within seconds of sliding into a booth, a waitress in blue jeans, tee shirt and a ponytail, stepped away from the grill, grabbed a pot of coffee and an empty cup, and was now standing next to the booth, with a friendly smile. There was no radio or TV to boom out the news, so perhaps that was the reason for her optimism. She poured the just brewed coffee into a small, white, heavy cup made from porcelain. The coffee steamed, bursting with freshness. The complete menu filled two sides of a small, rectangular placard, covered in laminate. Practically one whole side was devoted to breakfast. The other side listed French fries, baked potatoes and tacos as appetizers. Dinner entrees were chicken, shrimp, and cod. There were fifteen different sandwiches available. More people continued to file into the diner. The front wall held a few small posters, listing the schedule for the Catholic school’s basketball team, advertising a cleaning service, announcing a farm auction, and offering Avon beauty products at really low prices. A wire stand left of the entry door framed the headlines of a national newspaper. Notes of “How was the fishin’ yesterday?” from the back table of six men in fishing garb, harmonized with the “It’s our anniversary, we’re not goin’ on a cruise or nothin’,” timbre of the middle-aged couple in the front booth. The “How’s the baby?” drawl from the counter rang in at the end. As soon as the waitress left with the order of a young couple, the girl got up, grabbed the diner’s copy of the newspaper, and shared half with her husband while they waited for their food. They read without reaction or distress. They read quietly, patiently waiting for their pancakes. A pair of grandmotherly types slowly inched their way out of a booth, remarking to each other while they wiped their lips and gathered their purses, what they thought of the candidates for the town’s upcoming elections. It appeared unanimous that the candidate must have manners and exhibit patience when answering folks’ questions. Similar comments cropped up from other patrons, and people who only stayed long enough for a quick cup of coffee. Conversations continued to flow and ripple as smoothly as the Mississippi River went past the front windows of the diner. Respect for the other’s right to voice an opinion stopped any deluge of anger. Interest in the topics being discussed released all well-thought out observations and insights. A woman came in to place a to-go order. She sat at the counter on one of the metal stools, answering inquiries into her mother’s health. She had come in frowning, obviously preoccupied, but when she left with bag in hand, her brow was relaxed and she was smiling. The fishermen changed to the topic of hunting, and how they spotted a deer once but couldn’t shoot it because it wasn’t deer hunting season yet. Two men in overalls came in, greeted everybody, and sat down in the booth towards the back, discussing the rising grain prices, economy and inflation, in a calm, matter-of-fact way. A paddlewheel boat pushed upriver towards the lock and dam. With a final chug of the remaining coffee, my breakfast was over. A smiling teenager nodded in friendly greeting and held the door open for me. The remote control to the car beeped, unlocking the door. White lines on the road cachunk, cachunk, cachunk, as they pour past the car, producing a peaceful rhythm that echoes the mind’s song. In a small hamlet in eastern Iowa – and probably in hamlets scattered throughout the nation – there is a meeting room where intelligent, astute, kind, law-abiding, and hard-working individuals, model the secret to living happy and serene. Things they cannot control are not given attention. Their family and friends are treated with respect. They live their life as the best person they can be, and somehow, the larger world takes care of itself. 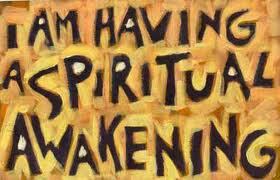 All the spiritual books and great spiritual leaders confirm what those people live. It’s turned out to be a beautiful day for a drive. We all share common survival needs for food, clothing, water, shelter, a physical need for safety, predictability and certainty, and a sense of connection and community. We recognize the frailties of our physical bodies and how close madness is when pitched against the disease of substandard wages and the ongoing torture of unemployment. The decline started with Reagan, and no president since then prior to Obama changed our nation’s course to protect us economically. One man…one lone man as president without the backing of Congress…cannot change a lifetime of bad choices in 4 years. (He might be able to do it in 5, though.) I cannot find one non-political, objective and mathematical statistics to support the position that Obama caused this and could clean it up in four years. That doesn’t mean you have to like the man. Please look beyond the house of mirrors that reflect Obama as the sole instigator of our economic woes (all Europe is fighting as well), and discover the other issues that matter to you, that may be hidden. I will share with you a fear I have as a very real female…he will protect my rights as a woman…the other candidates will not. My wish for today is thus: that all men out there against Obama consider choosing him to help protect me and the women in your lives who matter. For although we are not a Taliban country yet…the other candidates are sure putting out a welcome mat for them, and I am deeply afraid. In the end of course…vote your conscience. All I ask is that if you can protect me as a female, that you do so with your vote. Vote…it is our only voice to be heard as a united people for one cause: good leadership and safety through freedom.